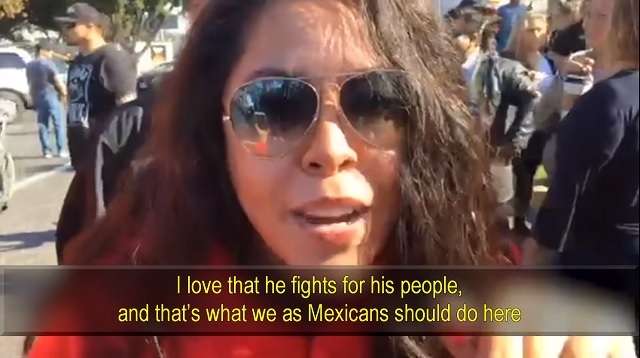 Video out of Mexico shows a Mexican business woman praising Donald Trump saying she loves "that he fights for his people" and "that's what we as Mexicans should do here." "I am Mexican. I support Trump," the woman tells a group of journalists. "I love that he is a Nationalist. I love that he fights for his country." "I love that he fights for his people and that's what we as Mexicans should do here." The woman said she has Mexican-US dual citizenship but chooses to live in Mexico because she wants to fight to improve her country. Media will never show you this! "I am Mexican. I support Trump. I love that he is a Nationalist. I love that he fights for his country. I love that he fights for his people." Hundreds of protesters organized in Tijuana over the past several days to denounce the caravan as an "invasion" and chant "Mexico First!"